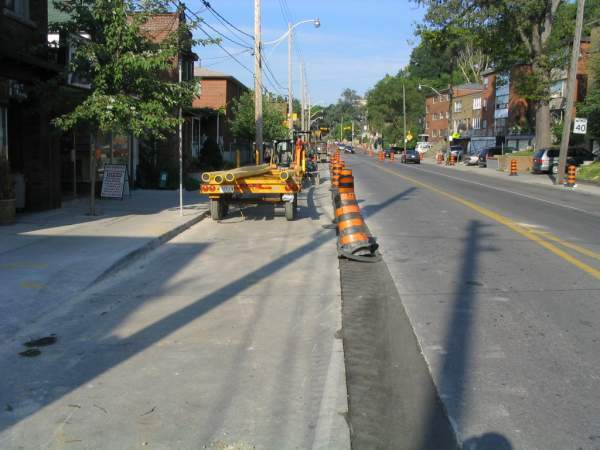 The bike lane along Davenport between Ossington and Dufferin has essentially been disappeared as a result of infrastructural work. 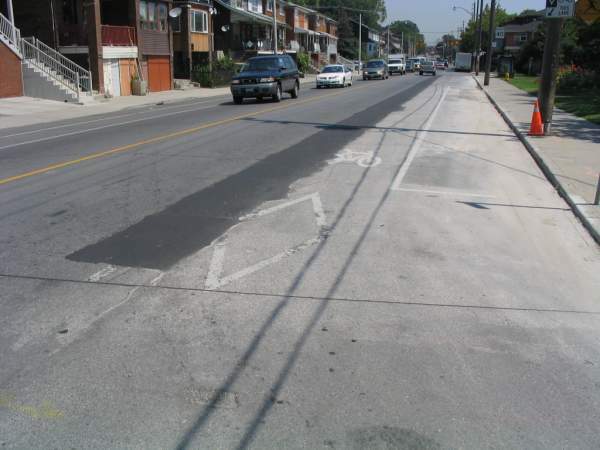 It was bad enough while the construction was going on, but the end result has essentially been an effacement of the diamond lane markings in places, and the complete ruination of the asphalt surface of the lane in others. 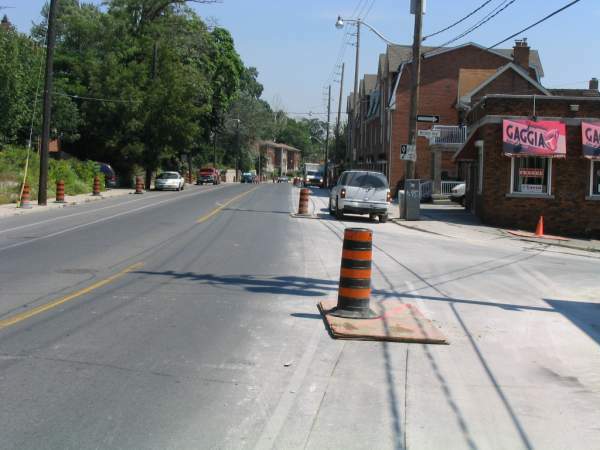 A recent Spacing Wire post about construction ruining existing bike lanes (see here) was pertinent as we near the frenetic end of the roadworks season. However, I’m loath to completely blame city services or the contractors for the results – the Davenport example was obviously a quite serious replacement of a water main or some other essential infrastructure beneath the street – it’s only a shame it happened less than a year after a large part of Davenport east of Dufferin was resurfaced. 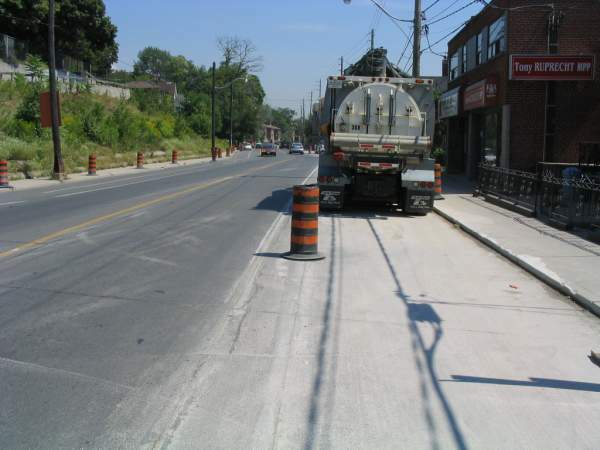 Additionally, placing services anywhere else would still lead to disruption – if they were placed closer to the middle of the road, the bike lane surface wouldn’t be ruined during infrastructural work, but vehicular traffic would no doubt be diverted over the bike lane during the work itself. 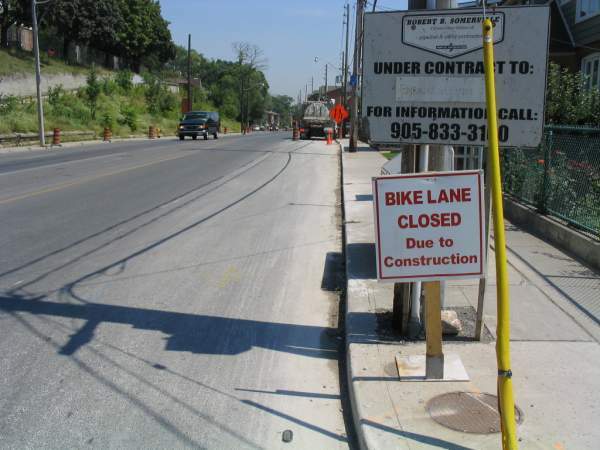 At any rate, there probably already is an infrastructural service under the middle of the road – in fact these days there are so many services under roads it really is a question whether it would be possible to locate them in a way that could reduce impact on bike lanes. 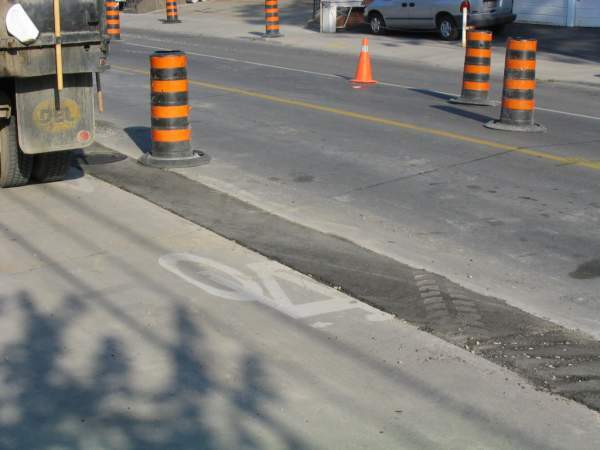 What is a shame is that in places the relatively fresh bike lane markings were right along the trench they dug – will they be repainting the bike lane? It hasn’t been done yet. In other places the trench is right down the middle of the bike lane and is terribly bumpy – so bumpy in fact that I’m forced to ride out in the vehicular lane. I know my cycling activist friends hate when I say it, but when I’m out there in the vehicular lane, it actually feels like I am where I belong. Call it idiocy, call it a desire for the thrills of mixed traffic, but I can’t help what I feel. That doesn’t stop me from being upset about the state of the bike lanes though. 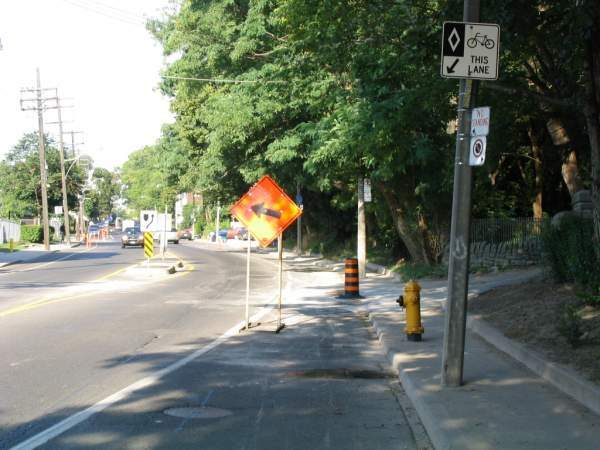 What added insult to injury was that construction affected the bike lanes all the way to Bathurst – despite minimal trench work east of Ossington – pylons and signs were placed in the bike lanes in what seemed an unnecessary way. To me this highlights two inherent weaknesses in the way we implement bike lanes. 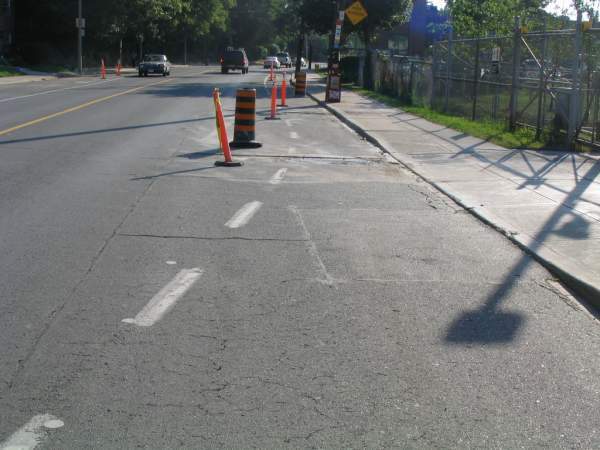 First, simply painting bike lane markings is an invitation for them to be effaced – by weather, construction, dirt. Second, bike lanes sharing the asphalt surface with the vehicular surface (with no barrier or curb between them) is an invitation for the bike lane to be used by everyone and everything – construction crews use them for storing their vehicles and crap – taxis use them to pick up and deposit passengers – cars stand in them when they’re being the pricks that they are – delivery trucks use them as a handy place to stop without interfering with vehicular traffic – pedestrians stand in them when they’re trying to cross the road. Short of stationing a police unit on every corner of the city, enforcing the sanctity of bike lanes seems hopeless. However, suggesting more off-road routes almost ensures that they will not be plowed and maintained in winter, and as a winter rider that is an unacceptable compromise to me. I know this doesn’t solve the problem of construction in the road right of way. Its not only the bike lanes and cars affected. The trees are also affected by access to utilities. Many of the streets throughout Toronto have trees in planter boxes to prevent conflict with utilities. One solution however, to properly demarcating bike lanes, can be found in Paris. 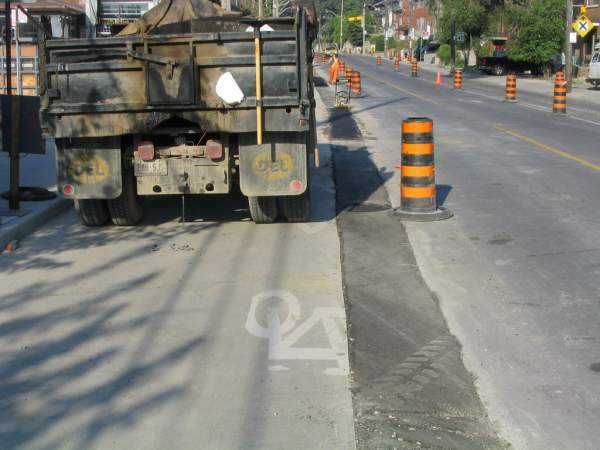 Here are some shots of possible divisions between vehicular and bicycle areas. Some work would need to be done to prevent snowplows from tearing off the strips, but I am sure there are ways around that. I ride along Davenport everyday to get to and from work, and the road construction that has been taking place all summer is a pain in the rear (literally). The stretch you refer to specifically that has been tarred over is too rough to cycle on so you’re either forced into the parking area and are squeezed between parked cars and the bumpy surface or out in the car lane. I move pretty fast but there are always going to be drivers who think you are in their way whose mentality is that we do not share the road but are an obstacle so it’s not uncommon to have a car speed past me dangerously close or honk at me. Another grey/awkward area is the stretch from Lansdowne going west until you get past the Caledonia underpass. The bike lane is out in the middle of the road and then fades to a broken passing lane. I HATE that section with a passion. To add insult to injury the state of the road at the Davenport/Caledonia intersection is appalling. Bumps, lumps and dips everywhere. Talk about bone shaker! There was a fellow on CBC Radio about a week ago who talked about cycling in Vancouver and how they have “Bikeways” in which the bicycle commuters/riders have the complete right of way, which is great but the biggest obstacle here is the mental block that many drivers have in their belief that bikes simply do not belong on the road. As long as their are drivers who think that way the roads will never be completely safe for cyclists. 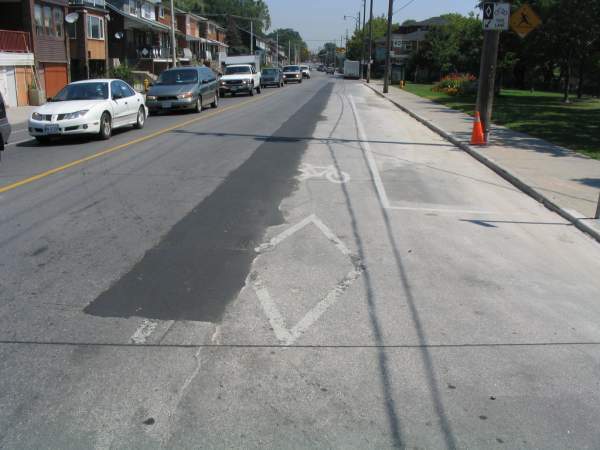 I think the problem with the bike lanes being repainted is that it’s private companies who have torn the street up in order to get at underground pipes etc, and while they are SUPPOSED to completely repair the roads they tear up, there is almost no monitoring of this, so roads, and bike lanes, just remain badly repaired.